I have long been a fan of the Sentinel games by Origin8. These tower defense games are some of my favorites. In creating BioSub, Origin8 explores a very different type of game. 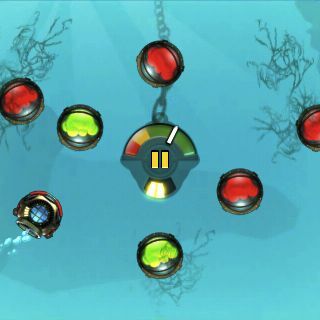 BioSub combines physics and problem solving into one very challenging and unique game. You are a mini sub and your goal is to destroy the canisters in the water around you. This is done by bumping into the canisters to propel them into one another. A canister is destroyed when you make it bump into another canister of the same color. If you make two canisters of different colors bump into each other, instead of being destroyed, they will cause a third container of a different color to be formed. The hardest part of the game is that you only have 30 seconds to destroy all of the canisters on the screen in each level. There are two types of controls available to use. I recommend trying both to see which one is more intuitive and easy for you. The first is tilt controls that take advantage of the accelerometer. Using these controls, you tilt your device to tell the sub which direction to move in. The farther you tilt it, the faster the sub will move. Controlling the sub by tilting alone is extremely difficult. However, by touching the screen you can apply the brakes. Thankfully, these brakes work very well and can be very helpful in controlling the sub. You can calibrate the tilt controls as well as adjust the sensitivity of the controls in the options menu. The second type of controls are touch controls. Using these controls you tap and drag on the screen to direct your sub. An arrow will appear on the screen in front of the sub indicating the direction that you have told it to go. The length of the arrow indicates the speed that the sub will move at. BioSub is a clever game. As you move through the levels, the challenge gets harder and harder as obstacles are placed in your way or canisters are tethered together with different types of materials. It takes some thinking to figure out some of the levels. My only complaint with the game would be that I found the controls hard to master. At first, I had a hard time controlling the sub. With the two types of controls and the ability to calibrate them, you can find the controls that work best for you. Remember that if your sub or the canisters go off the screen on one side, they will appear again on the other side of the screen. Everything wraps around. Moving your sub too quickly and hitting canisters too hard can often slow you down instead of making things faster. Use your brakes if you have to. You may have to create another canister of another color in order to get rid of all the canisters on the screen. The gameplay of BioSub is copied from E-Motion (aka The Game Of Harmony), a game released in 1990 for the good ol’ Amiga. Even the bonus rounds are the same.